The A105™ Standard Form of Agreement Between Owner and Contractor for a Small Project is intended to be used in conjunction with the A205™. You can't typically purchase them separately - or at least not from the AIA. The AIA has a set of documents, commonly referred to as the 'Small Projects Family Of Documents', that include the A105™, the A205™ and the B155™. These three AIA documents must not be used together with forms from other AIA document families without carefully comparing the documents - even though they may seem extremely similar to other AIA documents. At this time they no longer allow the purchase of the A105 without purchase of the A205 - and vice versa. Many years ago I found out that often times when a contractor was required to use an AIA form they would actually most often be allowed to use a form that was AIA-like, it didn't necessarily have to be an AIA-form, but they didn't know that or they didn't know where to get them. So I started looking around to see what I could find out about that. I came across this company, Quantumss, that has several programs available, one being an 'AIA' module. The first exciting bit of info was that this is so much less expensive than doing it the AIA way. Many times when someone uses AIA forms, and/or requires the use of them, that person isn't aware that there are programs that create documents that are literally quite like the AIA forms - without the exorbitant prices of course! It's Legal & It's So Incredibly Less Expensive! If you absolutely *have* to use an AIA form this program will fill in the AIA form(s) for you! You'll enter the information on your computer, put a hard-copy of the AIA form into your printer, and hit print. Voila! You didn't have to fill it in by hand and you didn't have to struggle with getting it lined up in a typewriter. If you're tired of submitting AIA forms that aren't up to par with your business's professionalism then I recommend that you take a look at this program. You can use the forms that are like the AIA forms when you are *not* required to use the actual AIA forms - and then when required to use AIA forms you'll use the program to fill in your hard-copies. We've known each other for so long that they give my readers an exclusive discount on their items, up to 40% off! You must use the exclusive discount code TCG after clicking this link. When you get there if you want to cruise around and see what else they have to offer (plenty of construction-related programs) feel free to do so but please be absolutely certain that you have the code TCG in the discount box BEFORE checking out. The discount will NOT be given after the purchase has been made. Enter the code TCG in the discount/coupon box if it's not already there to make sure you get up to 40% off of your purchase. They have various discounts for the many systems available, all of which can be purchased separately and/or together as one software program (you can also combine individual systems after purchasing them separately, say over a certain period of time). When you get to the website if you'd like to cruise around to see what else is there please feel free to float to your heart's content and check out the other programs they have - programs that help with construction paperwork such as certified payroll, vehicle tracking, the AIA forms, etc. Just *please* be absolutely certain that you have the code TCG entered in the discount box and that the discount is showing in your basket *before* you make your purchase. Need an instantly downloadable, fill-in-able PDF version of a G702/G703-LIKE form? Click here! 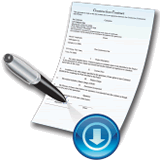 Psst... when using PDFFiller you can make electronic AIA forms out of your hard copy forms. Just thought I'd make you aware of what PDFFiller can do for you and the crazy expense of AIA forms.